The Coat Thickness Meter PT-FN is a mobile device for fast and precise measurements of coloured coats. This thickness meter is able to measure varnish colour and galvanic coats on iron steel as well as varnish colour and eloxal on NE metals as well as on antistatic steel. The coat thickness meter is also suitable for local measurements as well as for laboratory tests and incoming inspections. Several measuring probes can be connected without any problems. The user receives clear and easy legible, instructions via the display of the coat thickness meter in different languages (German, English, Croatian etc...). Faults of measurements are therefore, practically out of the question. The special construction ensures gentle measurement even when the objects are highly coated or really soft. Surfaces won't get scratched or damaged through the low and really constant pressure on the object. If there are any questions about the Coat Thickness Meter PT/FN have a look at the technical specification below or call: UK customers +44(0) 23 809 870 30 / US customers +1-410-387-7703. Our technicians and engineers will gladly advise you in all coat thickness meters and all products in the field of measuring instruments, regulation and control and scales. Here you can see the coat thickness meter taking a measurement on a motorcycle tank. 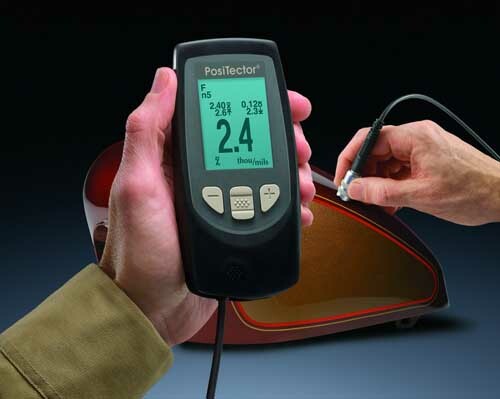 The Sensor is easy adaptable on the Coat Thickness Meter PT-FN. It has got a probe that is 90º offset. With this probe configuration you can get the ideal pressure on the measured objects. 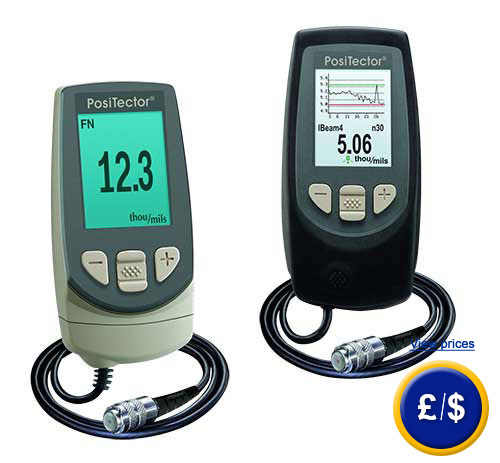 This sensor is suitable for measurements on steel and iron and aluminium (F/N). The measuring probe is fixed on a 1.5 cable. This probe will be delivered with the NIST- certificate. You will find the dimensions of the measuring probe on the drawing beside. This sensor is used to detect really small objects. This type of sensor (F) can be used just on substrates of iron and steel. The measurement range of this sensor is from 0 ... 625 µm. The sensor is able to be adapted easily on the coat thickness meter. You will find the dimensions of the measuring probe on the drawing beside. (Dimensions of F90S and N90S are the same). The probe is fixed on a 1.5m cable. This probe will always be delivered with the NIST-certification. This sensor is used to detect really small objects and materials. This type of sensor (N) can be used only on non-ferrous metal substrates and measures also in a range from 0 ... 625 µm. It is also easily adaptable onto the coat thickness meter. The probe is fixed on a 1.5 m cable. This sensor will also be delivered with a NIST certificate. All sensors are made of high sophisticated material that it can be used under water. Here you can find further products in the field of "Coating Thickness Meter"